Samsung has introduced the new display ML32E, the main advantage of which is a combination of functions of the information display and a conventional mirror, in particular a high transmittance (90%) and reflection (55%) of the polarizing film. This approach allows the new product to create a clear and vivid picture, reflecting located in front of her figures and objects with virtually no distortion. ML32E is an effective tool to attract the attention of customers and increase business profits. It can be used in shopping centers, fashion boutiques, beauty salons, hotels, halls, large public buildings. 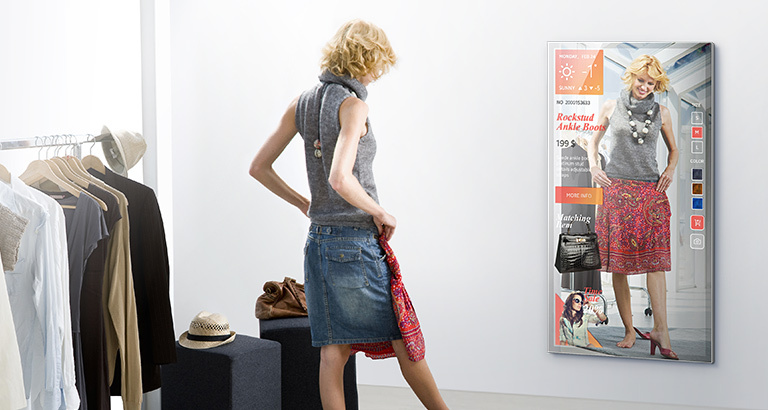 Frameless design – possible to combine multiple displays in a video wall with a minimum gap, virtually seam-to-seam, to form a single surface. The frame is hidden behind the mirror glass (with the printed black stripe on glass 20.4 mm). The flexibility of built-in sensors of presence – there are three modes of operation – from a distance of 0.7 m, 1.0 m, 1.5 m, so when approaching the customer the image will change from a small scale to full screen. 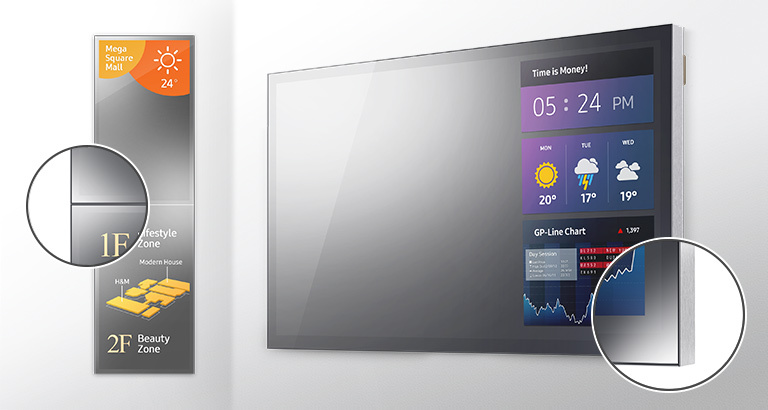 In addition, users can customize the shape and position of their reflection on the display. Remote management of content from a mobile device – smartphone or tablet. 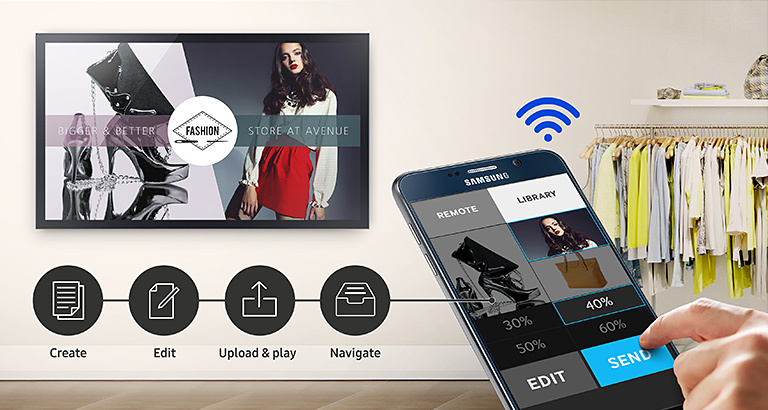 With Samsung MagicInfo application, you can select and configure a schedule for the display of any content – for that you should use the RS232 or LAN / wi-fi network protocol. Samsung SMART Signage Platform, controlled system System-on-Chip (SoC) and 4-core processor with 8GB of RAM – a powerful and effective solution that reduces the TCO in information systems and saving the cost of hardware and software support, installation and operation. 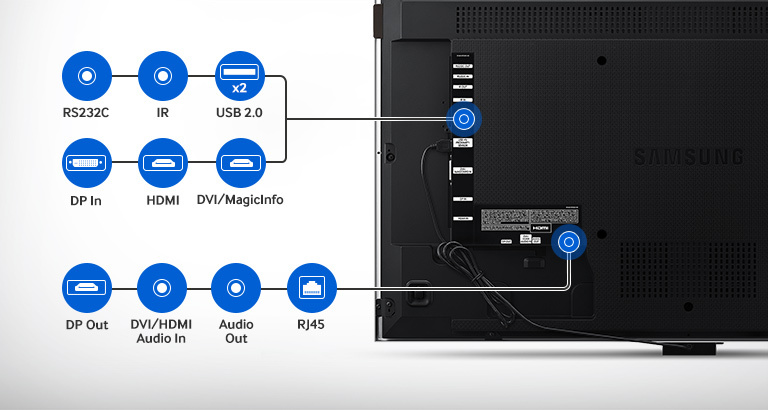 Enhanced Connectivity Options – 2 USB, DVI, DP, HDMI ports, component and composite inputs allow you to connect various digital devices that meet the needs of modern business.